The city of Osgiliath (Citadel of the Host of Stars) is the old capital city of Gondor and the first new Númenorean settlement after the coming of Isildur and Anárion. It was founded jointly by Elendil and his sons at the end of the Second Age (S.A. 3429) and settled with refugees from Númenor and those discontent to the policies of the Pelargirean League. Prior to its demise in T.A. 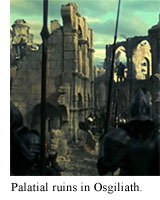 1437, Osgiliath was the chief city in Gondor and the royal seat of its Kings. During its heyday it was possibly the most populous town in Middle-earth. First bridge over Great Anduin was built shortly after the location was selected for new settlement. 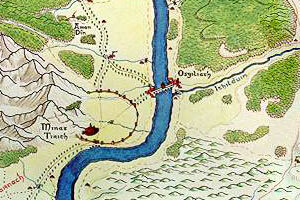 Isildur and his kinsmen built their homes on the eastern banks of Anduin while Anárion occupied the western shore. Their thrones sat side by side in the Great Hall of the Stars (Rond Giliath) at Tol Gilthoniel. During the War of the Last Alliance, Sauron attacked the eastern shore of Anduin, having overrun Isildur's folk at his hilltop fort of Minas Ithil. But Anárion rallied Númenoreans at Osgiliath and drove the enemy back to the mountains. The first bridge was torched down, but it was soon replaced by even greater timber bridge. Isildur's original construction was later surpassed by Anárion's youngest son Meneldil, who claimed the throne of Gondor after Isildur's death. He built a majestic vaulted stone bridge over Anduin during the first century and dedicated it to his grandson Eärendil, who was born in T.A. 43. Ruins of the famous bridge were still visible 1600 years later. When Gondor's fortunes waxed, Osgiliath became bureaucratic and ceremonial capital of a great sea-going empire. It's population quadrupled, and it was adorned by myriad of majestic buildings both public and private. Osgiliath was known both for its size and spectacular beauty, and thus it became the first prize for rebels who vied for kingship during the Kin-strife. King Eldacar was besieged in Osgiliath by supporters of Castamir (son of Calimir son of Calimehtar). 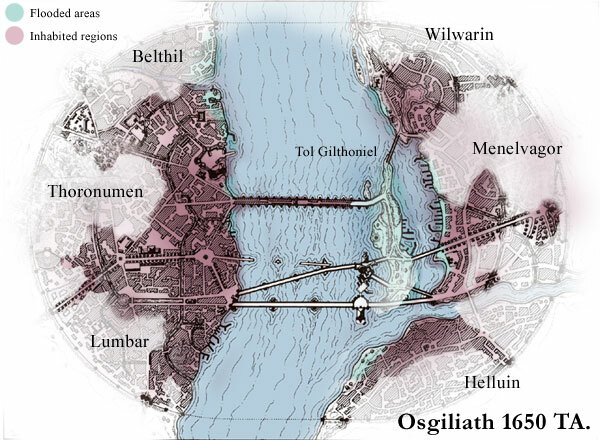 Osgiliath was captured in 1437 after a fierce and bloody struggle. The rebels burned and pillaged the city and slaughtered many of its inhabitants, including Eldacar's son Ornendil who was later revered as a saint. The Dome of Stars was destroyed and the master palantír was lost in waters of the Anduin. King Castamir moved his capital to Pelargir, and Osgiliath was left in ruins. When Eldacar returned from exile and defeated Castamir in 1447, he took up the kingship again in Osgiliath. Destruction brought by civil war was completed two hundred years later, when it was badly struck by the Great Plague, causing it to became partially deserted. King Tarondor made a radical move in 1640 when he suddenly moved the capital to Minas Anor at the foot of mount Mindolluin. Half of the remaining population relocated in Minas Anor, and Osgiliath became only a shadow of her former self, a living testament to the waning of Dúnedain. Unlike Gondor's other cities, Osgiliath possesses no rural hinterland of its own. Its walls straddle the boundaries of the wards of Anórien and Ithilien in the midst of the Anduin vale. The two halves of the city rise gently from the eastern and western banks of the Great River. Here, at its narrowest point, the Anduin ranges between twenty-nine and thirty-six hundred feet in width. Four large bridges (one of them ruined) span the breadth of the river. They reach the city by way of small islet near to the eastern bank. Although Osgiliath accommodates a moderately deep harbour, the Anduin is generally quite shallow as it passes through the city. It depth ranges from between fifteen to thirty-five feet. Most times, especially when the river is low, vessels possessed of a deep draft simply weigh anchor in Pelargir. When the river is high, flooding becomes a major problem in Osgiliath as the foundations of the city are slowly sinking in the soft ground. Numbers in the text refer to layout map at the end of this page. 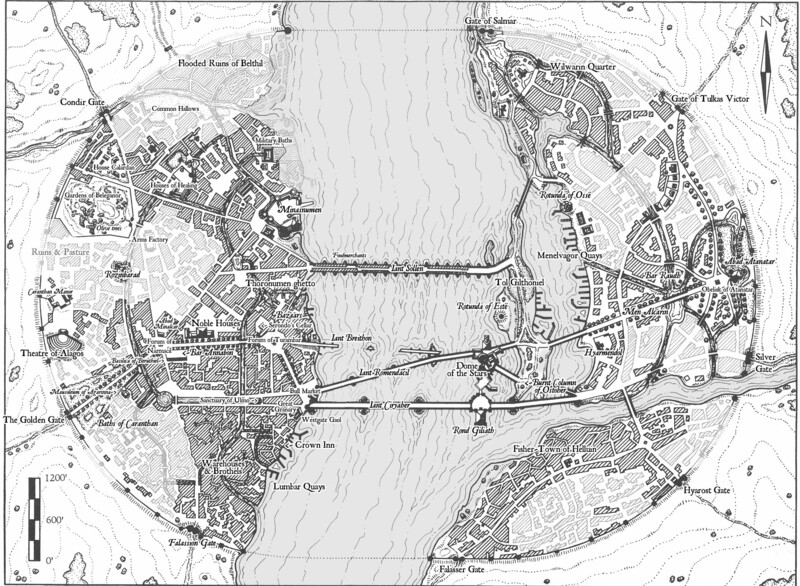 Osgiliath is in truth two cities, each of which sprawls out along its own bank of the river. Both halves of the city cluster around the gates ofthe Great Bridge and, in each quarter, all the city's streets extend outward from this focal point. While not designed to whitstand a siege, it was nonetheless walled during Castamir's reign (1437-1447). These hastily erected fortifications have subsequently fallen in bad repair, but were formidable enough to repel rebel forces under prince Sangahyandion during the Third Corsair War. 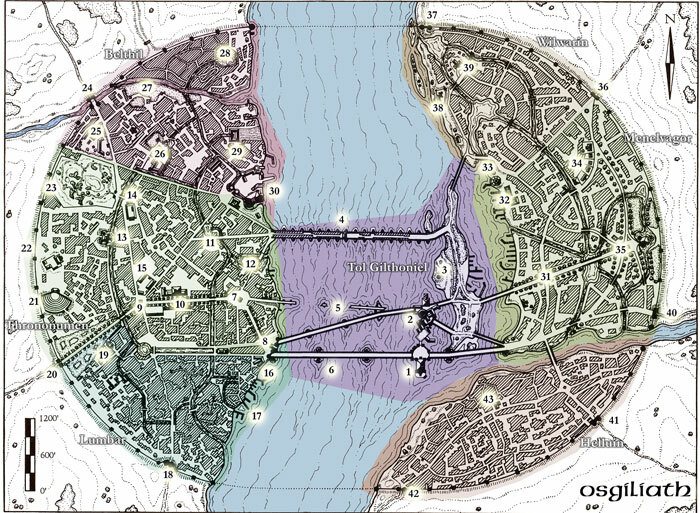 Osgiliath is organized into "heptonards". 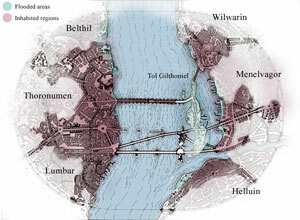 Three of these seven divisions (Belthil, Thoronumen, Lumbar, Wilwarin, Menelvagor, Helluin, Tol Gilthoniel) occupy the river, its islands, and the bridges comprise the seventh. These administrative divisions have now little import, as the bloody sieges of 1437/1447, the Great Plague and constant flooding have erased most of the meaningful administrative distinctions. Iant Breithon (2nd century T.A. ), formerly known as Iant Eärendil or Iant Iaur. Collapsed in 1303, lies in ruin. Iant Anardil (4th century T.A. ), connecting Dome of the Stars to Tol Gilthoniel. Repaired many times. Iant Sollen (8th century T.A. ), also known as Iant Siriondil. The Closed Bridge connects Thoronumen to Tol Gilthoniel and further to Wilwarin heptonard via Iant Formenel. Iant Ciryaher (11th century T.A. ), replaced timber bridge originally built during Isildur's reign. The Great Bridge. Iant Romendacil (13th century T.A. ), connecting the Bull Market to the Dome of the Stars. The Citadel of the Stars (Tol Gilthoniel). Several phases of construction dating from third to thirteenth century. Since Osgiliath is no longer the capital of the realm, there is no need for a royal bodyguard. The barracks are now empty, but the Toll-Wardens and their staff have their headquarters here. Minasnumen (Belthil). This ancient fortification was the site of original river ferry that predated the building of the Great Bridge. It was greatly enlarged during Castamir's reign. Now it is used as the central headquarters of the Royal Army under leadership of prince Vinyaran. Rozinbarad (Thoronumen). Former residence of House Rozin, now a major site of grain storage under royal authority. 1. Rond Giliath. Basilica, conceived by Isildur, construction dated to the reign of king Ostoher . The fabled former audience hall of the Govadan Gondorim are guarded by giant twin marble statues representing Isildur and Anarion. These immense monuments still exist, altough robbed of their gilded crowns and other decorations. Halls are partially ruined and still blackened from the immolation of 1437, which also damaged its beautiful polychromatic opus sectile marble floors. Statues of the first númenoreans still occupy the niches. Halls haven't seen any official use since 1540, but king Tarondor has taken advantage of the place as a romantic backdrop for exquisite balls and fireworks. Courtyard of Rond Giliath is an enclosed space joining the two arms of the Great Bridge together by way of fortified gates to the east and west. The gates themselves, made during Turambar's reign, are richly carved and filled with images of kings and righteous men ( Elendil and his sons, below them the kings from Meneldil to Romendacil I and the three Corvagin brothers), and were later copied in grander scale to Minas Anor. Northern entrance connecting the Citadel and Palatial Court to the Halls has been bricked up. This was the site of the massacre of 1437. A marble plaque and a porphyry statue commemorated to Ornendil, the martyred son of Eldacar , was installed here by his father in 1451. It is still a popular place for prayers of the common people and giving of votive gifts. Toes of the statue, kissed and rubbed by many visitors, are already worn away. A cult of semi-divine Ornendil has sprung up among the untaught commoners and especially the new royal bureucracy. They believe that Ornendil sacrificed himself so that his father, Tar-Eldacar, may live and vanquish the tyranny of Castamir, and for his piety he was taken straight to the Undying Lands by a shooting star where he can speak to Manwë in behalf of Men. Among immigrant northmen Ornendil is frequently seen as a divine hero, a man who gained immortality and deity through value, virtue, and deed. 2. Dome of the Stars. Palatial court of the Gondorian monarchs and the great Tower where the Master Palantir was installed are in sorry state. The great Dome has collapsed and only skeletal structure remains. Mounds of rubble fill up the old royal piers; flooding has destroyed the herb gardens. Royal archives and hallows built beneath the halls were completely buried by the collapse of the Tower. Most of the ancient documents and tombs were destroyed or irrevocably damaged in the calamity, and there has since been extensive efforts to restore, recover and remove what's salvageable. Most of these excavations took place in 1439-1490, and nothing of value is believed to remain there anymore, but the collapsed Dome and riches below it figures frequently in the local folklore. Fragments of the beautiful paintings (golden stars on blue background) in the cupola are still visible from below, though ravaged by time and fire. 3. Tol Gilthoniel. Once great garden islet is now a flooded swamp. Noble hallows have sunken into Anduin, but the graceful old weathered shrine and rotunda of Estë the Healer is still in use, being tended by a wealthy and pious family, House Telumendil. Walking along Men Brannon from the wrecked Dome of Stars to Iant Anardil one comes to a very old, tall and dismal-looking hooped porphyry column. It was erected on 11. Lothron 432 by king Ostoher to commemorate his victories over the dark races of Rhûn. Atop the column was a gigantic statue of the king Ostoher dressed as Tilion. In 1437 a conflagration destroyed the whole neighbourhood and tarnished the column with black scorch marks. In stead of the toppled wrecked statue, Castamir raised a golden miniature ship which was later melted down by Eldacar . Burnt Column of Ostoher (115 ft. tall) was left standing in ruins, slightly leaning to the west. Damaged stucco relief panels from the base of the column were robbed to adorn the private gardens of House Ascarnil. 4. Iant Sollen (The Closed Bridge, also known as Iant Siriondil). Grey granite construction with seventeen splendid arches. The covered and vaulted upper side of the bridge is known as the Sollen. The bridge is inhabited. Originally the sides were assigned to goldsmiths and silversmiths, now the damp and cramped apartments are held by quarreling foodmerchants. An opening midway across the bridge offers views of the river and shore. 5. 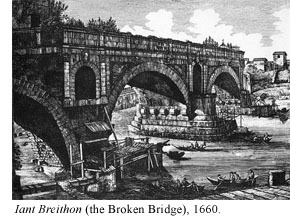 Iant Breithon (The Broken Bridge). Formerly known as Iant Eärendil or Iant Iaur. The most famous bridge in Osgiliath and also the oldest. The bridge was damaged in repeated floods and finally collapsed of old age in 1303. It was never repaired and Regent Minalcar replaced it with a new bridge, which was later inaugurated as Iant Romendacil. The Broken Bridge has captured the imagination of several osgiliathan artists as the symbol of the city and its rich history. Children and fishermen have lately used it as a place for picnic, and its arched vaults are covered by inscriptions and graffitos, some of them very old. They range from childrens doodles and scribblings to loyalist slogans from Kin-Strife. Most recent of the graffitos refer to the unfaitfulness of king Tarondor and his many bastards in a very graphical manner. 6. Iant Ciryaher. This travertine-coated structure with imposing stone arches replaced a wooden bridge which had crossed the Anduin river at this spot since isildurian times, connecting Rond Giliath to Forum of Turambar. It was built by the Ship-King Ciryandil (11th century) but dedicated by his son, Ciryaher Hyarmendacil I , defeater of the Haradrim, who is also known for his colossal statue at the Crossroads of Ithilien. Ornate travertine statuary, images of winged Turwén (Lady of Victory), gives the bridge a grandeur fitting for its location. 7. Forum of Turambar. Circular in shape and lined by colonnades, decorated by two monumental gates to the west and south. The column of Turambar still stands upright in the centre of the square, surrounded by an ornate fountain. During the reign of king Atanatar II Alcarin the square was decorated with a number of wonderful marble statues carved by Gildin Bernîthion. Most of them were cannibalized by Castamir in 1441 to adorn his new monumental buildings in Pelargir. Some of those statues were subsequently looted by corsairs during the Great Raid of 1634, others were simply destroyed by war, fire or neglect. Two of the surviving Bernîthion statues, thought of portraying the first Ship-King Tarannon Falastur and his brother Tarciryan , now stand before the towering mauseleum of Borathôr in Marös, Umbar. Close to the Forum are storehouses and bazaars for the sale of pepper and spices from Harad and Chey. Below them exists a popular wine shop: Serondo's Cellar, large enough to host over hundred patrons. 8. Market Square (Bull Market). The main market in Osgiliath is situated at the western end of Iant Ciryaher and Iant Romendacil. Colonnaded boulevard connects it to the forum of Turambar. A bronze bull statue gave name to the main market street: Rath Mundo. It has been the most important centre of traffic since the founding of the city. Before the great bridges were built over Anduin, ferryboats carried traffic across. This crowded area has often been devastated by fire. Head of the great granary is visible to the Market. Next to it lies the station of the grain dole, where free bread and grain is distributed to the populace. 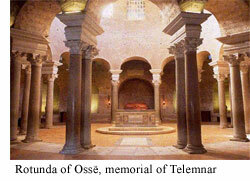 Of the shrines situated in or near Market Square, the round sanctuary of Tulkas the Unconquerable is the most famous; there is also those of Ulmo, Tulkas Astaldo and personified lady Anduin. Among other monuments are two fornices erected by hîr Dúlin Herenyand to his deceased wife and children (1249). 9. Forum of Falastur (Narmacilian square). Monumental square along the Men Aglar (Honour Road). Basilica of immense proportions originally built by Tarannon Falastur (10th century) and dedicated to his black númenorean Queen Berúthiel lies ruined in the south side. The basilica of Berúthiel rests on a 5 meter tall podium built of concrete. Its great granite pillars, still standing in the square, are 11.8 meters high. The central nave measured 80 meters (262 ft.) long and was covered by three groin vaults with a maximum height of 35m (115 ft.), supported by eight monolithic columns of 14.5m. The Basilica was augustly decorated by only black and white marble. After the demise of the loathed Queen her name was permanently erased from the Book of the Kings and her basilica was rededicated by the effeminate and pompous king Narmacil I . The ascetic decor in the basilica suited his mystical tendencies, shared by his brother and successor Calmacil . Minalcar (future king Romendacil II) didn't use the building at all, for he preferred the hardships of the frontier life to royal luxury and endless imagoes of dead men in Osgiliath. Valacar followed his fathers precedent, and for long the basilica stayed unused. 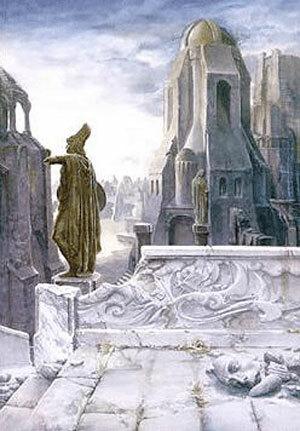 Intense artillery bombardment by Castamir's catapult barges during the first Siege of Osgiliath in 1437 destroyed the roof of the building; its sculpture courts (designed by Berúthiel herself) were turned into impromptu graveyards. During the Kin-Strife the ruined basilica was used as a temporary military camp. It was further ravaged by fire ten years later (1447) and collapsed during the riots of 1448. Destroyed marble decoration was burned into lime and remaining treasures were looted with deliberation by northern soldiers. The square was renamed after king Narmacil I in 1240 and was decorated by a bronze (originally gilded) equestrian statue of warrior-king Romendacil II after his victories over Rhûn in 1248. King Tarondor took this statue with him when he relocated the capital to Minas Anor. It stands now guarding the Tower of the Sun in the Fountain Court. After the burning of the Rond Giliath, Narmacilian Square has been the centre of goverment in Osgiliath and also a place for military parades, which traditionally start at the Golden Gate and continue along the Honour Road through fora and Bull Market, over Anduin by Iant Romendacil, past the Dome of the Stars and finally ending at the Palace of Atanatar Alcarin. Nowadays, the square is crowded by small shops, street kitchens and devious hawkers of looted relics and artworks. 10. Men Aglar. Cypress-lined Honour Road is bounded by ancient travertine porticoes decorated with lavish garland ornamets and mythological figurines. During the last thousand years up to the Plague, countless dúnadan monarchs, generals and princes have strutted down the Men Aglar in triumph, receiving the adorations of the multitudes, bathing in a shower of rose petals. Pretentious palaces along this glorious national show area have endured through thick and thin better than many other monumental buildings in Osgiliath. Rising three or four stories high, some even higher, they present the most imposing elements of the first millennium dúnadan architecture with their monumental colonnaded facades. Abad Mallen or the Golden House (10th century). Restored in 1380, 1449, 1475 and lastly in 1633, just prior the Plague. It has a dual purpose as the central bank of Gondor and the palatial residence of House Malréd. As every citizen of Osgiliath knows, the Golden House prides itself on the most luxurious private baths in existence. Courtiers and ministers are regular guests; banquets are usually held in the fabled gardens, full of miracles: Statues that can move, dwarven musical machines, magical fountains and mechanical singing birds made of gold. Abad Sindbar (12th century), house of the aristocratic Sindbar family. Renown for its extensive collection of famous panel paintings. Abad Sindbar was redesigned in the 1400s to be more withdrawn and fastnesslike. Original third and fourth floors were destoyed during the Siege of Osgiliath and restored in a more modest manner, with smaller windows and less flamboyant stucco ornaments. Abad Sindbar was abandoned for three years during the Plague (1635-1638) and lost some of its gilded statues for robbers. Abad Edhellen, Elvish Palace. Built by Elena family in the 5th century, this smallish but elegant palace is amongst the oldest surviving buildings in Osgiliath. It was designed as a fusion of a traditional númenorean villa and the noldorian architecture seen in the ruins of Hollin. House Elena was decimated in the Plague and the palace was abandoned. It escaped marauding robbers' hands by being deemed to be haunted - inhabited by elvish ghosts living in the very rock of the building. It is said that the elaborately carved doorposts were brought from Eregion. Its current elderly occupant is one Rothinzil Elena with her servants. Bar Annabon, named for the red granite elephants guarding its entrance, brought here by king Hyarmendacil I in 1051 after his final victory over haradrim. One of the elephants carries a runic (angerthas) graffito carved by an unnamed northman soldier in 1447: "These runes were carved by Gudaliufs with the axe that killed Kirathurs [Cirator Elena]. He bore great treasures from this house." Another runic writing on one column-head boasts: "Ingigunthis is the most beautiful of women. Redagais the Single-handed." and still another, bearing the names of Gudaliufs' eleven companions, is illustrated by images of a horse, a knotted serpent and a dragon. Bar Annabon is a complex of several structures, with a main entrance to the west where a monumental stairway lead to a porch of four porphyry columns with the accompanying elephants. Its 500 feet long northern aisle runs along the Honour Road. The palace started as a tribunal, but evolved in the 13th century into the official residence of the city prefect. It includes the Hall of Records, the Offices of Prefects and the Court where he renders his decisions. A huge statue of Hyarmendacil I stood in back of the court apse, carved from black and white marble and adorned with a face of gold, until it was accidentally destroyed by a barrage from Castamir's fleet. Pieces of the colossus, reminders of lost glory, are now in the gardens of the palace. Bar Annabon was thoroughly looted during the Kin-Strife, first by Captains and then by Eldacar's northerners. The palace was restored in the 16th century by prefect Istor Valandur Calardan. It is still an impressive sight but in need of repair, being ridden by exessive humidity, falling roof tiles (many of the original bronze tiles have been stolen) and occasional break-ups in the central heating system (the hypocaust). Dense residential area south of Men Aglar behind Bar Annabon had several four- or five-storey apartment buildings, solidly constructed and housing shops, little bakeries, workshops and small bathing establishments on the ground floor. After the fires of 1437 a few apartment buildings were converted into mansions. Now, when Tarondor has moved his administration to Minas Anor, the need for representative official residences has dimished. Some mansions have reverted back into cheaper apartments; others have been bought by prominent businessmen. 11. Vegetable Market, surrounded by shops and dwellings of every kind. Barbers, prostitutes, coach-drivers and other services are readily available. In the center of the market stands a single chestnut tree, which have given its name to a succesful inn on the brim. Market is the center of life in the thriving Thoronumen community, and its numerous wine shops are frequented by King's officials and functionaries. 12. Thoronumens' Ghetto. Always a populous district in central Osgiliath, situated in the western bank of Anduin between Rath Siriondil and Forum of Turambar. A busy, crowded, noisy, dirty area, the Ghetto houses trades and manufacturing, as well as crime, prostitution, and the poor. Prominent individuals controlling the gangs of the district are a haradan priest of Vatra with his flock, a twisted shoemaker with his many prize-fighting sons, a devious ironmonger protected by a well-armed mob, and a blatant wool merchant robbing tunics from the dead and selling them to the poor. The street connecting Ghetto to the forum of Turambar is the only better-off region here, belonging to booksellers and cobblers. The Ghetto is constantly threatened by fire, falling rooftiles, assaults and the "thousand dangers of a savage city", as one ithilean poet put it. Now (1650) the list of dangers also includes flooding, cholera, typhus, dysentery and malaria. The kings are gone, but the poor citizens of Thoronumen persist. 13. Rozinbarad. Once the residence of House Rozin, this fortification doubles now as a grain storage. During 1240-1437 it was the barracks of the Royal Horse Guards (Tirrim Roechbin Aran). Guards were dissolved when Castamir conquered the city and the castle was given to one of his captains. During 1480-1640 it housed four urban guard companies and a volunteer fire-brigade. Plague marked the end of such public amenities. Prince Vinyaran restored the castle to its original purpose and gave it to his own household cavalry guard (Roechbin Vinyarani). The original walls are of brick-faced concrete, with battlements and turreted gates. The castle is still supplied with fresh water by ancient lead pipes. 14. State arms factory. Production of arms and armour used to be very centralized in imperial Gondor. One monumental manufacture was located in the centre of the Smithies' district in Thoronumen. Under these colossal arched halls hundreds of craftsmen worked to produce finest mail and blade for the Dagarim Aran. Another factory existed below the floor, more secret and even more important: Moisture-sealed series of vaults where muted convicted criminals, supervised by select trusted professionals, produced the dreaded Naurnen, númenorean fire. Because of its strategical importance, the whole area was targeted in several bloody battles in the civil wars of 1433-1437 and 1447-1551. Arms factory was destroyed by fire during the Siege of 1437; the Captains were unable to capture the installation intact. Floor vaults collapsed, suffocating hundreds and utterly demolishing the secret workshops beneath. The whole district remained deserted for most of the 15th and 16th centuries. Osgiliath has ceased to be an important production centre; only few smithies are still in operation. In the post-Plague era ruins of the former manufacture have been utilized as a source of cheap building materials and a shelter for robbers and leprosy patients. 15. Abad Minalcar (Regent's Palace). Main administrative buildings in Osgiliath, spreading out north of the Forum of Falastur as a giant palatial complex. Building started in 1179, when king Atanatar II Alcarin ordered the renovation of the former Halls of Usuluni standing opposite the towering basilica of Berúthiel. Minalcar extended this palace towards the north-east and made it into so imposing an edifice as to excite remarks from every eminent gondorian chronicler. 21. Theatre of Alagos. An ancient edifice, built by one Alagos Alcarin, city prefect of Osgiliath during the reign of Atanatar I. The theatre was 111 m in diameter; it could originally hold 11,000 spectators. King Ciryandil ordered millenial celebrations of overthrow of Sauron to be held in the theatre. During the siege of 1437 it was used as a fortress; king Castamir incorporated its western side to his new city defenses. Ruined and abandoned, its travertine sheathing was robbed by king Tarondor to adorn his new buildings in Minas Anor. Now the lower portion is divided into multiple apartments for the poor. 23. Gardens of Beleganor. 17 acres of green in midst of the stony Osgiliath, the fabled gardens of Beleganor still host a remarkable collection of marble sculpture. Current owners, House of Herenyand, have declined all bids by king Tarondor. 16. Westgate Garrison and Gaol. Garrison of Osgiliath guards the Iant Ciryaher. Major criminals end up locked in the Westgate Tower, which is almost as notorious place of torture and suffering as the Angamando of Pelargir. 17. Lumbar quays. A densely settled harbour district, full of warehouses, brothels taverns. Dozens of galleys unload their cargo either here or at Harlond 15 miles downriver: tar from Rhudaur, hemp, ropes and sailcloth, turpentine from Ramlond. On the most famous lodgings in Lumbar is the four-storey Crown Inn, which is known for its kitchen. Mutton stew, salmon rolls and oysters of Belfalas cost more than 30bp per serving, so it is usually frequented by captains and merchants who also appreciate the choice of almost 30 different wines from Anórien to Lebennin. River's Edge is another famous inn, cheaper, favoured by locals, and known for brawls between sailors and stevedores. 18. Falassion Gate. One of the finest gate-keeps of the entire circuit, refashioned by Aldamir in 1533-1535. The two 28 m high towers, square for the first 18 m, round for the upper floors, are faced to an equal height with solid blocks of marble, mostly obtained from dismantled tombs. Passing to the inside of the gateway, the keystone of the arch bears in inscription in Sindarin thanking Tulkas and Manwë and mercy of Ilúvatar for the defeat of Sangahyandion in 1652. 19. Baths of Caranthan and Mausoleum of Agarinna. House Caranthan donated the royal capital it's main baths in 892, which are still in use (T.A. 1650), although supply of firewood is constant problem. The baths are now open only on fridays and saturdays, entrance fee is 1 bp. Just behind the venerable bath complex lies a huge mausoleum which has served the House Agarinna for a thousand years. It is in the form of a cylindrical drum on a square 29.6 m (100 ft) high base, decorated in frieze carved in blocks of belfalasian marble. It has an annular corridor, with alternately semi-circular and rectangular niches to contain sarcophagi round the pier and the outer wall. 20. The Golden Gate. Triumphal arch from the reign of Turambar (541-667), originally standing alone, was incorporated in the city walls by Castamir. It served as the state entrance into the capital. Architecturally elaborate, built of large square blocks of polished marble fitted together without cement, with three arches. 24. Condir Gates. The road leads north to Cair Andros and mouths of Entwash. 25. Villa of House Calardan. Although House Calardan has moved their lampwright works to Minas Anor where an entire street has been named after them, the elders of the house resist moving to the new capital. Calardan family remains important benefactors to the city, supporting the Houses of Healing and distributing the grain dole to poor people of Belthil. 26. Houses of Healing. Originally the villa of House Telumendil, this three story complex is now used by the Healers. It contains adjoining infirmaries, quarters for the healers, and a tower overlooking a branch of the Median Canal. The building is surrounded by a wall which also encloses a small herb garden. 27. The Common Hallows. This expanse of open land has served as the cemetery for Osgiliath's commoners. With the violation of many tombs in the wake of the Kin-strife and the Great Plague, many families have sought permission to remove their dead and lay them to rest elsewhere, so the grounds are punctuated by empty graves. Dismantled monuments are used in building projects elsewhere, as the uninhabited regions of Osgiliath are transforming into one big quarry. 28. Flooded Villa of House Orel. Palace of house of Orel (construction dating to the 6th century) has sunk to Anduin. Basement and first floor are completely flooded, but tales of ghosts and ancient treasures attract local youngsters to risk their lives in exploring the ruins. 29. Military Baths. Still in use, at least occasionally. Prince Vinyaran has promised to restore the baths to their former glory out of his own coffers. 30. Minasnumen. This ancient fortification was the site of original river ferry that predated the building of the Great Bridge. It was greatly enlarged during Castamir's reign. Visible crenellations and bastions are more recent work, completed during the reign of King Aldamir . Now it is used as the central headquarters of the Royal Army under leadership of prince Vinyaran. 31. Men Alcarin. Ceremonial road lined by great poplars lead to the ornate gardens of Atanatar II Alcarin , the richest monarch Gondor has ever seen. It bypasses some great edifices still in use. Hyarmendol was an institute for the training of royal pages. Now it has been taken over by the state bureucracy. It is currently occupied by office of public works and grain dole. Bar Raudh (Copper House) is still headquarters for the sale of vessels in bronze, but it has acquired other functions as well. Wholesale merchants, speculators, moneylenders and art dealers specializing in robbing the declining city from its still remarkable marble treasures have all invaded the venerable halls. 32. Menelvagor Quays. Once great quays are in midst of becoming a swamp. War galliots of the Anduin flotilla now anchor where royal pleasure ships once used to, and fishermen frequent the sturdy stone piers. 33. Rotunda of Ossë. Free-standing decagonal hall, 24 m (80 ft) in diameter and covered with a umbrella-shaped dome, 33 m (112 ft) high. Walls are lined with marble veneer; the underside of the dome with glass mosaic depicting Ossë, spirit of the sea and storms. Numerous statues of great Númenorean and Gondorian mariners fill the niches in the side-courts, which originally contained also fountains, now broken. In the 16th century, it was a luxurious dining pavilion used by Aldamir and Hyarmendacil II . Over-lifesize portrait statues of both monarchs were added in the niches by King Minardil in 1633. After the demise of Telemnar the Clement , the former pavilion was turned into a chapel commemorating the deeds and kindness of the king. 35. Palace and Obelisk of Atanatar II Alcarin. The Obelisk, dedicated to Arien, was carried off from the great temple of Korb Chelkar after conquest of Harad in 1050. 25.5 m tall and supported on bronze lions, it was re-erected by Atanatar II Alcarin in honour of his ascencion to the throne of Gondor. Pagan hieroglyphs were polished off and substituted with inscription in Quenya, with golden letters: "Atanatar II, son of Hyarmendacil, August and Glorious, honouring the Will of Valar, gave this as a gift to the Sun." Prince Vinyaran has used the former palace of Atanatar as his primary residence after being nominated condir of Osgiliath. 40. The Silver Gate. Road follows Ithilduin to the Crossroads and Minas Ithil. 36. Gate of Tulkas Victor. During the siege of 1447, this ceremonial entrance to the city was blocked up and reinforced with tuff blocks carved from Ephel Dúath. A smaller opening was cut to the gate in 1475. Most of the circular wall had collapsed along the Wilwarin heptonard by the end of the 16th century. It was hastily repaired during 1651-1652 by dismantling abandoned buildings in the quarter. The travertine masonry of the Gate and its superstructure survive to its full height at 19 m, and badly damaged frieze depicting Vala Tulkas is still extant. Road leads from the Gate of Tulkas Victor to Forithilien, Dagorlad and Rhovanion. 37. Gate of Salmar. Ancient entrance of double travertine arches has been replaced by two semicircular towers of the late 16th century, with no windows, only arrow-slits. As the main citadel in Wilwarin heptonard it is now occupied by hîr Maegorod, magistrate and exalted member of the Govadan Gondorim, who sustains the basic functions of his heptonard and rules the small township with iron hand.